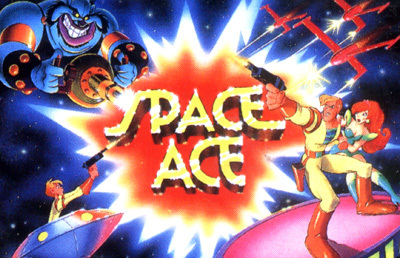 Space Ace follows the adventures of the musclebound hero Ace. At the start of the game, the villainous Commander Borf attacks Ace with the "Infanto Ray", a weapon that transforms him into an adolescent version of himself, and kidnaps his girlfriend Kimberly. It is up to the player to guide Dexter - Ace's younger incarnation - through a series of obstacles in pursuit of Borf, in order to rescue Kimberly and prevent Borf using the Infanto Ray to conquer Earth.